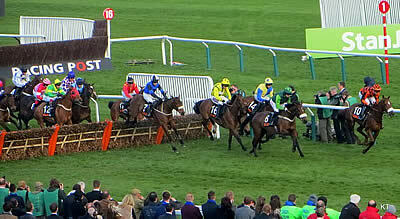 “Nicky Henderson has the National Hunt Chase ante post favourite in his stable this season” (CC BY 2.0) by danheap77. While the RSA Chase has considerable claims for being the classiest race for up-and-coming stayers over fences, its supremacy at the Cheltenham Festival has come under threat in recent years. This is because horses that have won or placed in the National Hunt Chase – also for novices – during the last three years went on to land some of the most valuable stayers’ races in 2018. What’s the difference between the two Festival events? The RSA is over three miles and holds Grade 1 status, but the National Hunt Chase is a four-mile Grade 2 contest for amateur riders only. Despite that, the likes of Native River (Cheltenham Gold Cup), Sizing Tennessee (Ladbokes Trophy), and Tiger Roll (Grand National) have all run well in the inferior race, but then gone on to even greater things. Who could be the next staying star of jumps racing? Here are three candidates for the 2019 National Hunt Chase. One of the few races reigning British champion trainer Nicky Henderson hasn’t won is this one. In OK Corral, he has a hugely talented Mahler gelding who is lightly-raced for a nine-year-old and unbeaten in two starts over fences. As OK Corral represents leading Irish owner J. P. McManus, who since 1995 has had more winners of the National Hunt Chase than anybody, he’s a serious prospect. Crack amateur jockey Derek O’Connor partnered the horse to his second chase victory over the stiff fences of Warwick at Listed level – strongly suggesting this race is the plan. Bookmakers were quick to make OK Corral ante post favourite off the back of that victory, and he is now 100/30 with Betfair in the latest Cheltenham betting. If getting the trip, and he has a stamina laden pedigree being out of a Flemensfirth mare, then the Henderson hoodoo in the National Hunt Chase could well end. Willie Mullins holds the rare feat of riding and training two winners of this race. The Closutton master handler saddled Rathvinden to the spoils 12 months ago and impressive Naas Grade 3 winner Ballyward is the sole representative from his yard in the early closing entries. Mullins’ son Patrick is one of the top amateur riders in Ireland and Emerald Isle raiders have won four of the last eight renewals of the National Hunt Chase. Ballyward was sired by Flemensfirth and placed fourth in both staying novice hurdles at the Cheltenham and Punchestown Festivals last season. Connections didn’t mess about over the smaller obstacles, giving the seven-year-old just four starts, but he’s taken his form to a new level now sent chasing. While Ballyward may seem young to be taking on a four-mile marathon, he fits the age profile of most winners since 2005; so, at a general 6/1 with bookies, he is respected for an Irish stable that targets the Cheltenham Festival. As the National Hunt Chase is over an extreme distance, there are very few obvious trials for it. One horse who has acquitted himself admirably in a real stamina test is last year’s fourth Impulsive Star, who retained novice status for this season. Although the Neil Mulholland trained nine-year-old was beaten 24 lengths by Rathvinden and also finished behind gutsy mare Ms Parfois and Sizing Tennessee 12 months ago, and has something to find on Plumpton form with OK Corral, he took a big step forward last time out. Impulsive Star is now rated a 7lb better horse because he’s won a race over fences in the Grade 3 Classic Chase over 3m 5f at Warwick. Given his victory in a competitive staying handicap like that under the owner’s son and former Cheltenham Gold Cup winning rider Sam Waley-Cohen, an each-way punt looks great value at 14/1 with William Hill and others.